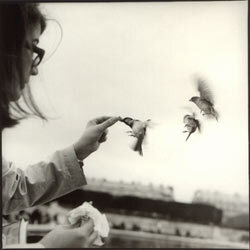 Lisa J. Garner has been making photographs for as long as she can remember. Starting with a brownie camera that her Pop-Pop gave to her filled with film. Her photos have a wonderful air about them. She intuitively sees scenes with a delicate, intelligent eye. Someone wrote an article about her in the Spanish magazine, La Fotografia Actual. She has won three ASMP (American Society of Media Photographers) Big Picture awards. Nine of her images are part of the Boston Public Librarys private collection. Her work has appeared in many publications, such as; ArtNews, Metalsmith, The Boston Globe, New York Newsday, and Vineyard Style. She has photographed large bulls. With a camera in her hand, she is fearless. There are great poems and songs in her photographs. The people, places and things she sees are beautiful. To her, the world is a noble, hopeful place: moving towards beauty. Together with her husband, they form the photography team of Garner and Cowie Photography and shoot weddings. You are invited to view their work at www.garnerandcowiephoto.com. She invites you to correspond to her with any questions about her work and services. 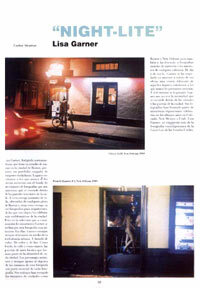 Lisa's photography in La Fotografia Actual (issue 44). Click above image to see article.